Established on May 26,1852, this adobe built, two-company post was located on the west side of Cow Creek, about two and a half miles from its confluence with the Sacramento River at the present town of Redding in Shasta County. Established by 1st Lieutenant Nelson H. Davis, 2nd Infantry, by order of Colonel Ethan Allen Hitchcock, 2nd Infantry, commanding the department, the post, often flooded during the rainy season, was primarily intended to protect the mining district from Indian depredations. 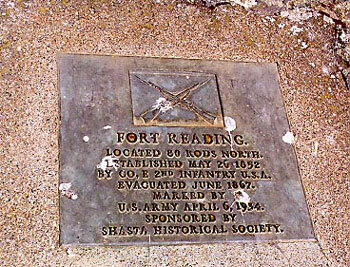 The fort, one of the earliest posts in northern California, was named for Major Pierson B. Reading, paymaster of the California Volunteers during the Mexican war, and a pioneer settler in California. Although the garrison was withdrawn on April 1, 1856, the post was intermittently occupied until June 13, 1867, and completely abandoned on April 6,1870. The fort's buildings were sold prior to the restoration of the reservation to the public domain on February 15,1881. From Redding, California (city that spells its name differently because it is named after a railroad man rather than the fort) take Interstate 5 south seven miles to the North Street exist in Anderson. Go north (left) on North Street across Sacramento River to Dersch Road, about two miles. Site is 5.4 miles directly east of this turn. The marker is 0.6 mile north of the intersection of Deschutes and Dersch Roads.